Here is a quick tip on how you can do to view the commands that Exchange Management Console runs in the background when you do changes using EMC. EMC is basically just a GUI that runs PowerShell commands in the background to execute the changes we make in the GUI. There are two ways of displaying these PowerShell commands. This button is very useful and easy to find. It is located in the bottom-left corner of the dialog boxes used to reveal and set properties on Exchange objects. When you click this button a window opens, showing the Windows PowerShell command that Exchange will execute when you click OK or Apply. Again, you can use this button to view the commands BEFORE you actually apply the changes. 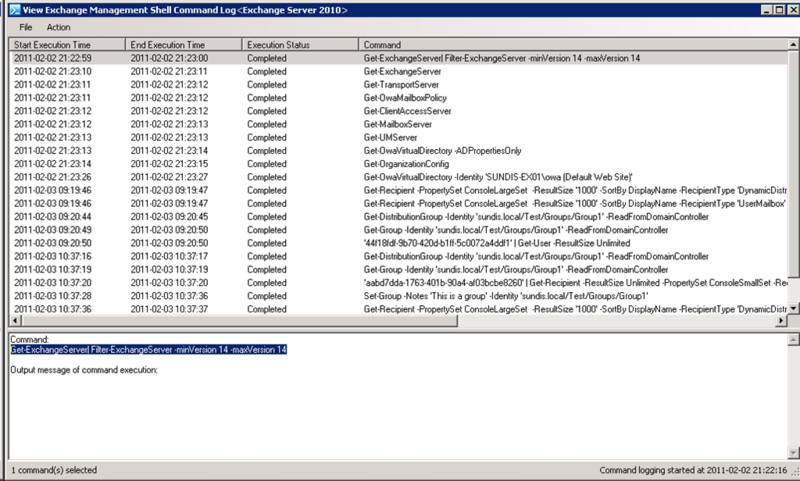 Another tool new to the EMC in Exchange 2010 is the Exchange Management Shell Command Log. It records all shell commands that you run in EMC. You can use this tool to log commands, view then and also export them to a CSV file. I the lower pane you can see and copy the commands, this is an excellent way of getting help and tips when creating PowerShell commands and scripts.